If you're asking what this is, then you're in for a most pleasant surprise. This is the cover to a wonderful, new book put together by the talented people at Stash Books and the equally talented people at Robert Kaufman fabrics, makers of Kona cotton solids. In the interest of full disclosure here, I should tell you that I am one of the 16 designers lucky enough to have a quilt in this book, but that's not entirely why I love it and am recommending it. The concept for this book is brilliant because it focuses on a very, simple idea: designing and crafting modern quilts using just solids. That allows for a couple of things: first, the contemporary look so many of us are drawn to is really at it's best when rendered in solids. Solids let the designers and makers focus on shape and line and all those fabulous elements of design rather than get caught up and distracted by prints. Second, Kona encompasses so many color choices that you won't have a problem finding colors that work together and are really not limited by the solids-only approach, but actually liberated by it. And, if you weren't already blown away by the plethora of colors available to you from this collection, hold on to your quilted hat because Robert Kaufman fabrics is introducing 28 new colors, including this intense, rich blue, Regal. I love this color almost as much as I love pistachio (here,I am referring to a color, but I want the record to show that I love pistachio in all its forms including the ice cream variation). If you're still grasping your hat then you're ready to receive the next bit of information I'm throwing your way. Stash and Robert Kaufman fabrics are giving away two fabulous prizes: a copy of the book and a bundle of the new Kona colors. I know. I know. Be still my heart. What do you, lovely reader, have to do to win that prize. Well, I'm going to ask for something a little out of the ordinary prefaced by a brief explanation. The quilt I designed for the book is called the Sweet as Pi Baby Quilt. 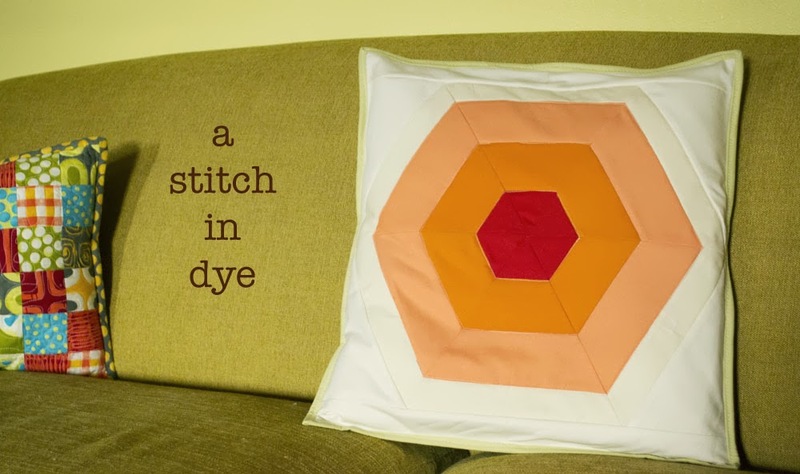 It's a simple-to-make round quilt. I like shaped quilts; I think you'll like them too. I also love the play on words of Pi meaning 3.14 and the means to determining the size of a circle and its homonym, pie, which I can eat in copious amounts. So, if you'd like to be entered into the drawing for the book and fabric bundle, tell me what you favorite pie is. If you have a link to an online recipe, all the better, though it won't influence your chances in this totally random drawing. If you'd like more info and to see the tour schedule, click here of here if you'd like to view and, hopefully, join the flickr group to show off your own We Love Color creations. I think that's it. Go forth and be colorful, my friends! Pecan pie is my all-time favorite. 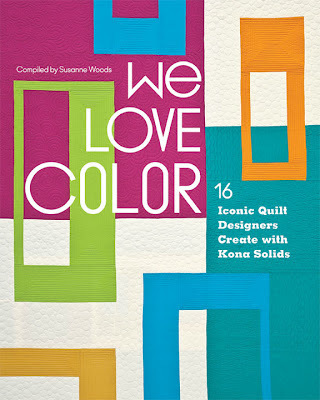 I can hardly wait to see your round quilt in this book and the colors you've chosen for it. Thanks for the super wonderful giveaway, I would be over the moon with excitement to win (Maybe I'd mail you some flapper pie in thanks, LOL!). i gotta go with the classic pumpkin pie as my fave. there's something about a simple apple pie with a crumb top that satisfies every time. Blackberry pie is the best, and this simple recipe is terrific! For me, it's a tie between chocolate pecan and coconut cream pie. Now I'm hungry! My favourite pie must be apple pie with lots of cinnamon served hot with a big helping of vanilla ice cream! Must be blueberry! Can taste it already. I love Blackberry and Apple pie made with a simple shortcrust pastry and have done so since I was a little girl. Very nice with custard. My very favorite pie is Cherry (Cerise, in the new R. K. collection of 28 colors). Definitely Apple pie. With vanilla ice cream. Apple pie warm from the oven with a crumb topping and a scoop of vanilla ice cream on the side - YUM! I love peanut butter pie with chocolate crust... it's like a big Reese's cup! I love Key Lime Pie best...and the colors of key lime pie, too. Too many pies to choose just one! I guess if I have to narrow it down it'd probably be Key Lime. Yummy! Thanks for the chance... alonzoteressa(at)hotmail(dot)com. I love peach pie. If only I could make one as good as the pies my grandmother made when I was little. My very favorite pie is banana cream pie. Made with banana pudding not vanilla. I have also alwayvs preferred graham cracker crust to regular crust. That is until I became a girl scout leader and I read that old women will buy a supply of shortbread cookies and freeze them to use as shortbread cookie crusts! Oh my!!!! I have never looked back! Banana cream pie, with banana pudding and shortbread cookie crumb crust! A couple years ago, while at a Bible study, one of the ladies brought this http://www.foodnetwork.com/recipes/paula-deen/not-yo-mamas-banana-pudding-recipe/index.html . I can't even put into words how decadent it is! It is so easy, too! I don't even want to know how many calories, because once I start eating-it's on! I'm drooling as I write! I think I need to go to the store! This is a MUST TRY! Any pie my sister makes. i love a lot of pies, but this one is nice and simple and uses blackberries, which are literally weeds here in oregon! 1 cup of flour, 1 stick of margarine and a TB of sugar mixed in the pie plate and cooked for 40-50 minutes at 300. Something about the first strawberry pie makes the beginning of summer official! My dad and I had the same favorite pie - sour cream raisin with a great big meringue top! I miss my dad. Cherry pie.....haven't made one myself but I love it. Pumpkin pie! I love it. I could eat it all year, but restrain myself, b/c I also love the excitement when it's FINALLY pumpkin pie season! My favorite pie? Well, I love Chocolate Cream Pie, Cherry Pie, Dutch Apple Pie, but I guess it might be Cheesecake with Sour Cream Topping. It's really easy, and delish! You could also not use the topping and top it with fresh fruit. Mix all the ingredients together in a bowl, and beat at medium speed for about 3 minutes. Pour the mixture into the pie crust, bake in pre-heated 350o oven for about 30 minutes or until the cheesecake is set in the center. Remove from the oven and let cool for about 20 minutes before adding the topping. Whisk all the topping ingredients together. Pour over the top of the baked cheesecake. Bake at 350o for 10 more minutes. Cool to room temperature on a wire rack, then refrigerate for several hours before serving. This recipe can be doubled and baked in a 9” or 10” springform pan. Increase the baking time from 30 minutes to about 45 minutes. Growing up in Alaska its a toss up between strawberry-rhubarb and huckleberry pie!!! It IS hard to decide, especially since I like the crust best of all! But apple is my favorite. Cherry pie is my fave. My mother made the most wonderful Pecan Praline Pie - it is my favorite!! My favourite pie is a French lemon pie. Pi is my birthday, March 14! My favorite pie is my mom's apple. We had two apple trees in our yard, so we had a lot of pies. Now I need pie. My favorite is good ol' apple pie. My favorite- Chocolate Pudding Pie..thanks so much! So many pies to love! A pecan pir is really good! I have to go with Boston Cream Pie. Yummo! My favorites are coconut cream pie and cherry pie! I love Cherry Pie! Yummmm. My favourite pie will always be homity pie from Cranks restaurant in Dartington, Devon, UK. Cheese and potato with shortcrust pastry. Real comfort food! Cherry! or Key Lime! Can I have both? Strawberry-Rhubarb is so good, too. I love my grandma's chocolate cream pie, with a heaping pile of Redi-Whip on top. That's easy...pecan pie, preferably, Dear Abby's recipe which her daughter occasionally publishes but I'm sure you could find it elsewhere. It's a Hawaiian favorite - chocolate haupia - from Ted's bakery, preferably. Chocolate mousse and coconut custard. so yummy! Hmmmmm this is a toughie, but I think its mississippi mud pie. I am not much of a pie eater but when I really want pie I love, love fresh peach pie or coconut cream pie - those are my favorites. Fave pie is merseyside meat pie, an English creation is my favorite. It's a toss-up between pumpkin and lemon meringue. Oh, there are so many pies to love! (Much like colors!) But if I could only have one pie...I think it would have to be apple, with grated cheddar cheese cut into the crust with the butter, and lots of cinnamon and a hint of ginger. Mmmmm. This time of year in central Texas there is one pie that beats all others - PEACH pie. It's my favorite summer pie. Of course I am fickle and in the fall I love apple. Thanks for the wonderful give away. When you live in central Texas, there is one kind of pie that beats all others in the summer - peach pie! That one is my all time favorite. Thanks for hosting this wonderful give away. I really love what I've seen about this wonderful book so far and who wouldn't love to win those gorgeous fabrics? !! This is a recipe I found a few years ago and I have to say this is THE most incredible pie recipe. And how fitting that the blog post it came from talks about National Pi Day :) Even if you don't love coconut cream pies, please keep an open mind and make at least one of these! Trust me. SOOOOOOOOOOO good. I've converted those visiting my house that hate coconut pies once they've had some of this. I have to make two at a time of this pie and don't skimp - use that real freshly whipped cream. My favorite is blackberry. As in Pacific Northwest small blackberries. No link, just a much loved,worn out recipe card with my Mom's recipe. Blueberry cherry pie! A nice combo of the two flavors. I also like it as jam. Hi! My favorite pie is PECAN. I don't get to have it very much because it's so rich but I love it! Thanks for the chance to win!! I love homemade pecan pie!! Of course, there are lots of pies I like. Pumpkin is my favorite. I make it with about 2/3 eggnog to 1/3 evaporated milk. This makes it really rich. You have to bake it about 15 min. longer than normal. Honestly, I am not sure which is my favourite pie. It could be blueberry, cherry or lemon meringue pie depending on the day. Thank you for a fun giveaway. Looking forward to seeing your round quilt. Blueberry pie, in Maine, overlooking the ocean! Overall favorite pie is the pecan pie that my mother makes. During the summer, I like strawberry pie. grape or lemon or strawberry or pumpkin or key lime. actually I like all those colours too! thanks for a chance to win! My very favorite is Pecan Pie!!! We love June because we can have strawberry/rhubarb pie. I do grow my own rhubarb and have had it a few times in the form of a 'crunch' and we also we to pick strawberries last weekend and at the farm they said they just stopped picking on Tuesday! Well, I decided to plant my own plants so now one of our raised beds are full of plants! If your competition is open to international readers, my favourite pie is cherry pie with whole juicy cherries in it, yum! How about chocolate bisquit roll! Thank you! Japanese Fruit Pie...its so yummy! Oh mmm pie! I just made pumpkin for my husband last week because he really likes it, but my favorite is lemon meringue, and I just make the recipe on the Argo cornstarch box! Chocolate Pecan Bourbon...my daughter's favorite that I make for holidays! French silk pie with a shot of Chambord. YUM! I love peach pie. Now that you've got me thinking about it, I may just have to make one this weekend. Pecan or Strawberry Pie - Thanks! My favourite pie is a savoury one. I love egg and bacon pie. I also love a traditional apple pie. Not sure you would classify this as a pie, but I love Palova (first introduced to it in Australia) with passion fruit drizzled over the meringue and other fruit tropical fruits! I loved what you said about solids helping you feature the design rather than the prints! Warm cherry pie with vanilla ice cream on top ! I think my favorite pie is generally whatever is on my plate. :) But I'm especially fond of peach, cherry, key lime, and pecan. My favorite pie is Strawberry Rhubarb which is in season!! We have a fruit grown here on the prairies called Saskatoon berry. It is similar in colour and size to blueberries, but the taste is different, They make the BEST pies ever!!! rhubarb pie. however, this summer my daughter made 'blueberry bars' using this recipe, but replacing cherries with blueberries: http://www.bibisculinaryjourney.com/2010/07/cherry-oatmeal-bars.html it is not a pie, but i think i prefer it to pie. it has a crumb 'topping' for a crust and for the top. so far we've made it with cherries and blueberries, and i think you could do it with rhubarb, too! My favourite pie is Sour Cherry pie, it is sweet & tart at the same time & completely delicious. Thanks for the chance to win this amazing prize. Oh goodness, that is an easy one!! Rhubarb custard pie is my all time favorite!! I like so many pies--although sometimes without the crust. The one I'm longing for right now (because I haven't had it since I moved away from the South) is chess pie. Fresh peach pie is my favorite pie, but I like lots of pie. Hands down, coconut cream. Although I have to put in a plug for any pie beginning with the words "sour cream". For our birthdays (which are a day apart), my "other" dad and I used to enjoy sour cream cherry and sour cream rhubarb pies. That is a sweet memory in several ways. lemon merangue pie is, and always has been, my favorite pie. after all these years, i no longer bake them. sigh. I love all of the quilts in this book. I've never made a round quilt. I think I need to do that. I only make two kinds of pie. One because the fruit is free and the other because it is my all time lifelong fav. The first is blackberry and the second is pumpkin. From scratch. With honey, not sugar (I use the Moosewood recipe). Yum to the extreme! I love lemon icebox pie. I wish I had the recipe myself! Just thinking about it almost makes me drool, kind of like that bundle of new solids. Thanks for the chance to win. All these pies sound delicious. I'm going to have to visit one day to try them. We just don't have them in Wales. I make a mean blackberry and apple when the fruit is all ripe in Autumn but when I read the competition my first thought was for a savoury pork pie.Hand raised pastry and slow grown hand raised pigs from a friend of mine. 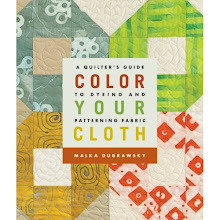 Another great quilt book to add to my wish list. Thank you. My favorite pie hands down is four berry! It is a mix of blueberries, rasberries, strawberries, blackberries....yum!! I like key lime pie and lemon chiffon pie. Funny about that, I love the colours lime and lemon too! What an inventive question for a fantastic giveaway! Thank you, Malka. Favourite pie, that's easy - it is Apple Crisp because I do not care for pie crust! But I love the idea of fabric and a new book! Apple - and they have to be sliced not diced! As a maths nerd I also have a love of Pi! As for pie I love Bakewell pudding - not strictly a pie but it's delicious! My mom's apple pie. I can't eat any other apple pie anymore. Good thing my 13 year old nephew is learning how to make it so it will stay in the family for generations. My favorite pie is blueberry made with fresh piced berries. Yum. Thanks for the chance at your wonderful giveaway. Rhubarb,prune plum, green apple, raspberry. All tied for first place, but many others follow them. mmmmmm pie. I love all kinds of pie. I think my favorite is strawberry-rhubarb. I love lots of pies, but picking one... peach/apricot. Though strawberry/rhubarb is a close second. And apple is good too. With ice cream. If you think I am going to say Pumpkin Pie because it is healthy you're wrong. I like the ooiest-gooiest pie I can find. Usually a cream cheese, cream pie with lots of whipping cream. My favorite pie is Kentucky Derby Bourbon Chocolate Walnut Pie. Several years ago, I was lucky enough to attend the Kentucky Derby every year at Derby time I make this pie to revisit that memorable trip. Try it at American Food.com. The new book looks inviting!! Can't wait to see it and your quilt. Your color combinations are always so clever and fresh! I am very excited about this book because I definitely love solids! I am actually not a big pie person (I know, I know)...but I do love pumpkin pie! My favourite pie is rhubarb, and my grandmother made the best. My best memory is visiting her when I was 15 and eating her rhubarb pie for breakfast. Grandmas are the best. Pineapple pie has been a recent favorite but all time I would go with banana cream! I've loved reading all about your pies, such strange and wonderful combinations that we simply don't have in the UK. My favourite sweet pie is banoffie but as I am very much a savoury girl my favourite pie of all is Steak and Kidney pie with a flakey pastry top. I love a plain old Shepard's Pie. Meat on the inside and mash on top. It has to be bought from the pie shop and eaten when its too hot so that I manage to burn some part of my mouth. sounds like a great book, love solids but haven't worked with them much since I love prints so much. my favorite pie is from Marie Callender's lemon cream cheese, haven't had it in forever though! My favorite pie is strawberry pie. Thanks for the giveaway! Lemon Meringue Pie is my favorite! Reading these comments is torture; the bakery is closed for the night! I think my favorite is whatever I can concoct from the ingredients currently in my pantry. Rhubarb would be my choice. Unfortunately here in Singapore rhubarb is very, very expensive where at home (Switzerland) it grows like a weed in my mum's garden. Great giveaway; I'm keeping my fingers crossed. Apple. Can't wait to see the book. my favorite pie is chocolate cream ... yummmy I LOVE the book and have plans for kitting up fabrics to make a few of the patterns already. If I happen to be fortunate enough to win the book, I'll be sending it to my mother who also quilts. My favourite has to be apple and custard pie, that is, the custard is inside the pie along with the apple. And what an amazing prize on offer. My favorite pie is Chess pie. It is an old southern favorite. To me it is basically Pecan pie, without the pecans. This is a wonderful giveaway -- thanks!!! My favorite pie of all is apple, in it's many forms. I had a birthday pie last month instead of cake and the apple pie had caramel on top! Yum! Cherry pie a la mode for me, please. Thank you for a super giveaway and a chance to win. The book sounds awesome. Well, considering that I don't eat pie, I'll say that my son's favorite is cherry pie. He made one on Friday and I have photos and will probably write a blog post tomorrow! Fantastic color while he was cooking the cherries! My favorite pie is the kind that is served under ice cream!!! Pecan pie is, without a doubt, the best pie. Make it into chocolate pecan pie, and you have a total winner! I like the color pistachio too! Mmmmm, pie! All these comments have me craving pie, and where to begin? Fresh peach or strawberry? Rhubarb or berry pie? Key Lime or banana cream? I love a good pie! I love fruit pies, and if pushed to choose just one I'd have to say cherry - speaking of color. There is nothing quite as gorgeous as a slice of bright red cherry pie with a rich vanilla ice cream slowly melting off the top:). And your idea of using solid fabrics is wonderful. I get all caught up in the patterns and colors which make up a fabric, but I do think you're right that the design can get lost. Thank you for the food for thought! And congrats on your part in the book. Lemon Meringue - for sure!! Thank you for the awesome giveaway! Ok, pie is my favorite dessert, so I can't say I have just one favorite. Top ones, though, are cherry, blackberry, pecan and lemon meringue. I love your Pi quilt explanation! Hmmm - favorite pie? It would have to be an apple and rhubarb pie, complete with my homegrown rhubarb - I just love the sweet and tangy combination of flavours. Thx for the chance to win - can't wait to get my hands on a copy of the book - won or purchased - it looks so inspiring! My absolute favorite pie is pumpkin!!! I love, love, love it! Frozen Strawberry Margarita Pie: http://www.foodnetwork.com/recipes/strawberry-margarita-pie-recipe/index.html I leave out the spirits and it is my kids favorite pie as well. That would have to be key lime - yum! Key line is my favorite! Lemon meringue or maybe cherry. Hard to pick. Strawberry rhubarb pie is my favorite, hands-down. There's just something about the sweet-tart flavor. Blueberry pie is my favorite. Pecan, make 2 - one with maple syrup one with chocolate. Love the browns and amber color of it too! Pumpkin pie, all the way. oh....Blueberry Pie with Vanilla ice cream of course!!! Alright if I really have to pick a favorite I guess it will be banana cream pie! Looks like a great book! My favorite was my Mom's Surprise Pie made with Ritz crackers and nuts and egg whites...would love to find a recipe for this! Not sure if I'm too late to comment. I've been away from the computer for a few days! I can't wait to see your Pi quilt! My favourite pie is definitely saskatoon pie. I miss western Canada for many reasons, not the least of which is picking saskatoon berries! To answer the favorite pie bit it would depend on what time of the year it is. In fall, I don't want to eat anything but pumpkin pie. But right now during summer, I can't even imagine eating a pumpkin pie! Berry pies (all kinds!) are my favorite summer pies :) They're so fruity and SO yummy! My mom's raisin pie would have to be my all time fave. I miss my mom and her pies. I love a good Blackberry Pie! Chocolate mousse pie!! Really anything chocolate. Thank you for the amazing giveaway. Someone is going to be so lucky! Pumpkin pie! My mom is a master of this pie and my mouth waters for it every fall though I live too far away to eat hers and my attempts continue to fall a bit short of that custardly glory. Key lime pie....oh how I wish I had a slice right now. Makes me think of lime and kona snow. My favorite pie is cherry, thanks for a chance to win. Well looking down the list I am in good company. Cherry Pie with vanilla ice cream and a warm sunny afternoon on the deck. I love pie & love to bake them ! nice warm Tarte Tatin....mmmmmmm ! Sweet potato, it is a vegetable it is good for you! blueberry. The question reminds me of Simon and the purple crayon and his 9? favorite pies. A diner here in Vermont makes a maple cream pie that is amazing - very mapley but not teeth curdling sweet. My 87 year old mom's gooseberry pie and rhubarb pie. Of course, she doesn't use a recipe...just a little of this and some of that! Apple pie is my favorite. Does that make me boring or mundane? Ah who cares, give me apple pie any day of the week! I bought this book the minute it was opened in the quilt store I work at. I ran home and made your quilt! Please check out my blog...I just posted a picture of it. I made it for a display at the Oregon State Fair in September, but for now it will hang at Greenbaum's Quilted Forest to advertise your book. We have many, many people coming thru our store on their way to the Sisters Quilt Show so I have no doubt they will all buy your book. Thanks for the inspiration. Pie making is one of the best skills I learned from my mom and grama, about equal to sewing. So difficult to name a favorite, but I guess I'll go with Gooseberry - because we only make it with the challenging to gather gooseberries from the farm. Sweet reward for very hard work! Yummy! Reading this makes me want to go home and make a delicious strawberry rhubarb pie, best served with vanilla sauce!